Will a mother’s search for the truth about her son cost her the two children she has left? Jackie Rose is a mother on a mission. Determined to prove her eldest son did not commit suicide, she enlists the help of her best friend’s husband, Homicide Detective Charlie Cooper. Reluctant to reopen another team’s case, but even more reluctant to upset his wife, Cooper and his partner Joe Quinn investigate. They soon discover Jackie Rose is right – someone’s killing kids. The deeper Cooper and Quinn dig, the more they realise everyone has a secret to hide. Can they find the killer before more young lives are lost? As Jackie struggles to cope with the circumstances surrounding her eldest son’s death, a new threat emerges. Her ex-husband, unhappy with the effect of the case on the family and concerned Jackie’s becoming increasingly unreliable, wants to take their remaining two children to the other side of the country. Will Jackie’s fight to clear her son’s name cost her the two children she has left? 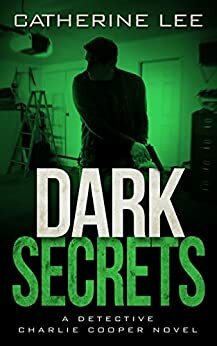 Part police-procedural, part domestic thriller, Dark Secrets is the third in Catherine Lee’s page-turning Dark Series. It tackles the difficult themes of bullying and teenage suicide, but at it’s heart it’s another rollercoaster murder mystery with a kick-arse detective team and a twisting plot that will keep you guessing until the end. Pick up Dark Secrets to read Cooper and Quinn’s latest adventure today! Jackie Rose is convinced that her eldest son Lachlan did not commit suicide. Lachlan was only seventeen. But when the police investigating the case advise Jackie that Lachlan’s death has been officially ruled a suicide, Jackie is reluctant to accept it. Jackie enlists the help of her best friend Liz’s husband: Detective Charlie Cooper. While Cooper is reluctant to investigate another team’s closed case at first, he doesn’t want to upset his wife. So Cooper and his partner Joey Quinn start looking at the case and soon form the view that someone is killing kids and making it look like suicide. Who? And why? In the meantime, Jackie’s preoccupation with Lachlan’s death is causing her ex-husband Marcus concern. He’s worried about the impact on their other two children, Ethan and Emma. Especially after Jackie forgets to pick Emma up from school and she goes missing. Will Jackie’s increasing unreliability cause her to lose her two remaining children? The action shifts between Cooper and Quinn’s investigation into a number of teenage deaths that have been ruled suicide. The deeper Cooper and Quinn dig, the more secrets they uncover. Cyber-bullying is a factor, but will Cooper and Quinn be able to put all the pieces together before another teenager dies? I couldn’t put this novel down. Ms Lee has written a fast-paced novel involving the sad and tragic issues of teen bullying and suicide, and on some of the consequences for family members where relationships breakdown. How do families cope with the death of a child? How do children address and survive bullying? Ms Cooper maintains tension throughout novel as the story moves between Jackie’s personal issues and the police investigations. At the same time, the characters of Charlie Cooper and Joey Quinn are further developed, and Charlie Cooper has his own family responsibilities to consider. This is the third novel in Ms Lee’s ‘Dark Series’. I will now wait as patiently as I can for the fourth novel: ‘Dark Chemistry’ (which is, according to Ms Lee’s website, due in July 2017). The best by Catherine yet. I connected with her characters right away and feel like I got to see more of Quinn in this story. I really enjoyed his character in this book. The subject matter is so hard but very real and this story kept my emotions on edge as I worked through this mystery with Cooper and Quinn. I think this is what I love the most about Catherine's books. I follow the journey with the characters. I can sit back and be sucked into their world and weave through the tale with them. I loved seeing the return of Andy from book 1, even if was just a small bit. It makes the world of Cooper and Quinn more real. This story kept me on edge from start to finish. It left me so emotionally charged afterwards and I haven't felt that way in a long time. Thank you, Catherine, for another brilliant story. I can't wait for the next instalment of Cooper and Quinn. Dark Secrets is the third instalment in this great series by Australian Author Catherine Lee. She uses her local knowledge of Sydney and surrounds to great effect again in this crime drama that deals with bullying and the social issues around it. The pace is quick and the twists and turns will keep you guessing 'who done it' until the end. The novel continues to expand on the Cooper and Quinn universe, their relationship, their backgrounds, family life (or lack thereof) and the circumstances surrounding their partnership are all explored - leaving you wanting more. Presumably this will occur in the forth instalment of the 'Dark' series which I cant wait for. 4.0 out of 5 starsA must read for any parent with teenage kids. The third book in the Cooper and Quinn mystery series is a very intense novel. It deals with a number of issues that are, either totally or to a large extent extent, taboo in our society. At its core the book deals with teenager suicide (or is it murder? ), and more particularly about the effects that has on the remaining family members. Other issues are bullying, teenagers struggling with their sexuality, the after effects of a relationship break-up, exclusion of teenagers that do not conform, parental pressure on kids and the devastating effects that can have, social media use of teenagers, an extreme career focus leading to parental neglect, to name just a few. All of these issues could easily lead to lecturing, but fortunately the author has avoided that trap and deals with it in a very objective manner. In spite of all these social problems, the novel is not gloomy at all. There is a positive and caring tone throughout with friends helping each other out, Jackie going out of her way to aid a lonely teenager, loving family dynamics, teenagers prepared to make the ultimate sacrifice to protect their loved ones. A must read for any parent with teenage kids.